It may seem bizarre to compare Kat Sandler’s play Mustard, which recently premiered at the Tarragon Theatre, with Henrik Ibsen’s Hedda Gabler, recently revived by Necessary Angel at Can Stage, but bear with me. Cara Ricketts as Heda Gabler in the 2016 Canadian Stage Production. Photo by Dahlia Katz. Ibsen came of age in the mid 1800’s. He grew up in a small town, which was a tight but strictly ordered community, where everybody knew everyone else’s business. He fled the small town and the small country (Norway) to create a “revolutionary theatre” that championed individual freedom, particularly for women, from the arid constraints of middle class life. This is all apparent in Hedda Gabler which shows a young middle class couple begin the play with all material and social signs of normality and ends with Hedda, who ranks with Hamlet as one of the most fascinating characters in dramatic literature, shooting killing herself to avoid a lifetime of boredom and mediocrity. Fast-forward 125 years to Mustard and we have a portrayal of a very different family. Women, again, are the leads but the family, instead of beginning whole, begins fractured by divorce and alcoholism in the single mother and teenage pregnancy and violence on the part of her daughter. The dramatic arcs are opposite. Hedda Gabler moves tragically from the constraints of tradition and community to the freedom of death. 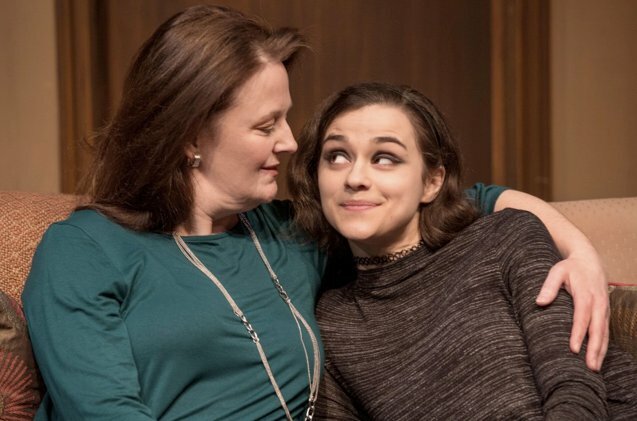 Mustard shows two women struggling to control the excesses of personal freedom and moving towards a longing for the stability and sense of belonging that comes from relationship and community. Sarah Dodd and Rebecca Liddiard in Mustard (Photo by Cylla von Tiedemann). In my mind, despite the Ibsen’s astonishing control of his art, the latter is more relevant and, in Sandler’s handling of the material, more uplifting.